The work of the associated TABULA/EPISCOPE partner University of Belgrade / Faculty of Architecture was done by experts of the University on a voluntary basis without funding by the IEE programme. The main objective of this case study was investigation of different scenarios for building stock refurbishment on local level through the use of local building typology. This was conducted through a pilot project in municipality of Vršac, being the typical representative of “middle size” city in Serbia with population between 40-60000 inhabitants (it stands for 12% of total municipalities), having at the same time distinct urban and rural areas with locally characteristic building types. This case study encompassed several actions. The first action was development of appropriate methodology for creating a relevant local residential building typology. Two methods were designed, tested and compared in this step, leading to the formulation of a methodology that can be used according to the size and characteristics of the selected municipality. Local building typology developed for municipality of Vršac was used for next steps, including definition of different scenarios for analysis and their comparison. One of the main goals of pilot project was development of adequate methodology for data acquisition and local typology matrix formulation. Methodologically, two different approaches have been developed in order to derive local typology: top-down and bottom up. In top-down method, database created for development of National typology of Residential Buildings is being used and expert projections are done for the local level, based on the available local sample. Applicability of the typology is directly influenced by the extent of the existing databases and other data sources available locally: cadaster, district heating companies, energy companies etc. as well as expertise of the team conducting the work. Bottom-up method, on the other hand represents direct approach where a new methodology has been developed for an in-field survey design, enabling adequate data acquisition serving as the reliable basis for all future work. 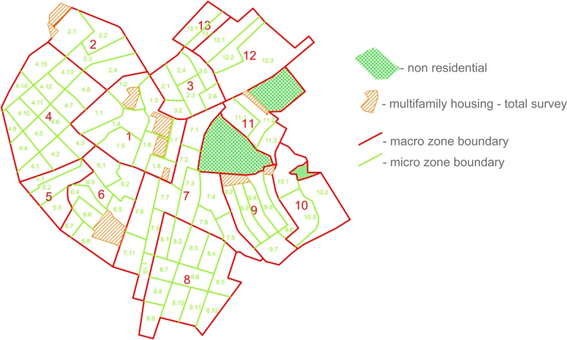 Bottom-up methodology enables municipalities of different size and structure to define, execute and evaluate locally programmed surveys covering for the diversity and individuality of their building stock. This method combines statistically relevant approach for survey design with the building characteristic relevant approach. For this reason this method is largely dependent on collaboration with local experts and their knowledge of local specifics. By comparing the gained results we proved the assumed uncertainty of top down method for locally representative types. On the other hand for the types that are most common both methodological approaches are giving similar results. It can be said that top down method is more theoretical, with lower level of adjustability to individual characteristics, less dependent on local support but faster in implementation, while bottom up is much more precise with high local significance by provision of local building stock database and locally relevant data, but also more expensive and time consuming. Starting point for any strategic planning or scenario development is represented in base case local building stock model out of which further trends and projections were derived . Following the current trend that annual demolition rate is almost negligible (0,1%), modeling of building stock was executed based on tree major portions: new stock, refurbished stock and unrefurbished stock, in variations of TREND SCENARIO, SCENARIO B and SCENARIO C.
For purpose of calculation of the trend scenario and future scenarios (2020, 2030 and 2050) data relevance proves to be of an utmost importance and developed bottom-up method serves as the only applicable methodology. Precision, data structure and openness for local specific questions in the process of surveying as well as adaptability to diverse municipal structures recommends this method for wider application, especially in the situation where no other data sources are available. By using local surveying we were able to determine refurbishment rate, energy carrier structure, levels of interventions and to statistically support the building matrix by providing relevant data. Trend Scenario is following the identified trends in the sense of refurbishment and valid regulations for the new buildings with projections of strengthening these regulations in the future. Annual refurbishment rate was estimated at 0,6% since it was assumed that refurbishment actions have taken place in previous 15 years. SCENARIO B and SCENARIO C annual refurbishment rates of 1% and 1.5% were estimated, respectively and also benchmark values of energy needed for heating in new buildings have been set more stringent. Refurbishment rate needed for the scenario modeling does not exist in available statistical data and for the purpose of the case study it has been derived according to the results from the in-field research as part of bottom-up method testing. Refurbishment rate for each building type was determined, as combination of identified refurbishment actions (window replacement, facade insulation, attic slab insulation etc. ), influencing the initial projections of the energy performance for the entire stock, by inducing 10% of savings. Besides refurbishment rates, estimation of values for energy needed for heating for the new buildings was concluded for each defined scenario, influencing respectively the energy performance of the new part of the stock. Current values defined in Serbian regulations were used as base values for scenario 2020, while for 2030 and 2050 new, lower values, are expertly defined. Scenario calculations for the refurbished part of the building stock are based on values obtained from application of two improvement levels: standard and ambitious, similar to those defined in National typology of Residential Buildings. 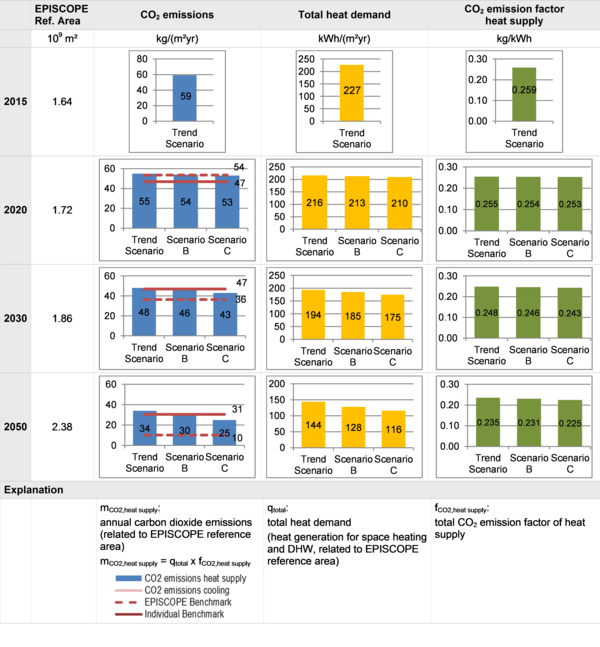 Projections of energy needed for heating after improvement 1 were used for estimation of refurbished stock performance in 2020, and after improvement 2 scenario for 2030. Unlike projections of total heat demand derived from different scenarios, projections and necessary calculations for CO2 emissions and CO2 emission factor of heat supply is more complex. It basically relies on relevant data on structure of energy carriers and heating systems efficiency currently in use in municipality Vršac, and further estimations of their improvements and replacements. For the present state these data was also obtained from the results from the inquiry of local buildings and used for calculations of the unrefurbished part of the stock. For the refurbished part of the stock estimation was done taking into account relevant building types, their present heating system, and possibilities for their upgrade and change of energy carrier. Individual benchmarks for CO2 derived based on the draft plan for reduction of CO2 emissions (reduction of 9.8 % until 2030 based on the values from 1990), have proven to be achievable only by implementation of scenario B and C in 2030, and only by implementation of scenario C in 2050. Also, EPISCOPE benchmark values have been proven unachievable for 2030 and 2050, and potentially achievable for 2020.